The extension saw the downstairs bathroom moved to the first floor and the three bedrooms made much bigger. The ground floor was opened up to create a large, open-plan kitchen/dining area and a light-filled garden room. “We even moved the staircase,” says Abigail, who adds: “I used a fantastic local builder, Joe Kitching from Well, and the project took just over six months. 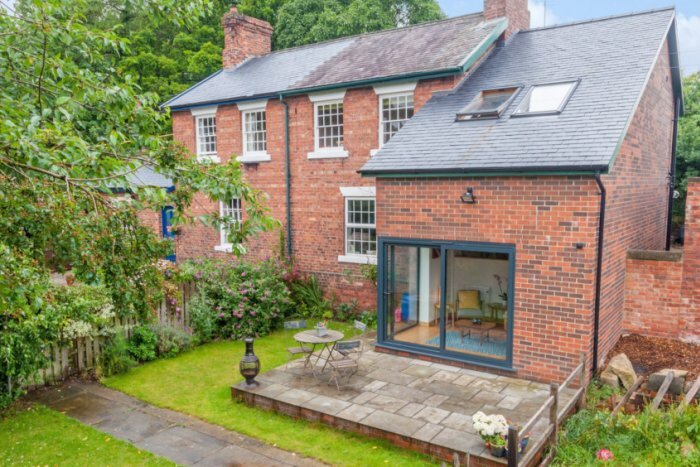 We have managed to transform an old railway worker’s cottage into a modern house ideal for contemporary living. ”The house now has a reception hall/study, a sitting room, a dining kitchen and a garden room with glazing to two sides overlooking the garden and a sliding glass door onto the patio. On the first floor, there are three large double bedrooms and a bathroom. Outside, there is parking for two cars. The garden has a large patio and a lawn. Chris O’Mahony, area manager at Dacres, says: “This lovely semi-detached home would be a perfect for a couple, family or somebody looking for a country bolt-hole that they could lock up and leave. Masham is a delightful market town and the cottage is situated just on the edge of town adjoining open countryside. Its position near the A1 also makes it easy to travel to Harrogate, York and Leeds. ”For more details visit www.dacres.co.uk or call 01765 605151.